Michel Verjux, Face à face/à revers (source au sol), 2016, projector and light, dimensions variable. You walk up a flight of stairs to access the gallery and as you enter, you are nearly blinded: this is Face à face/à revers (source au sol) (Face to face/to back [ground source]) (all works 2016) by Michel Verjux. 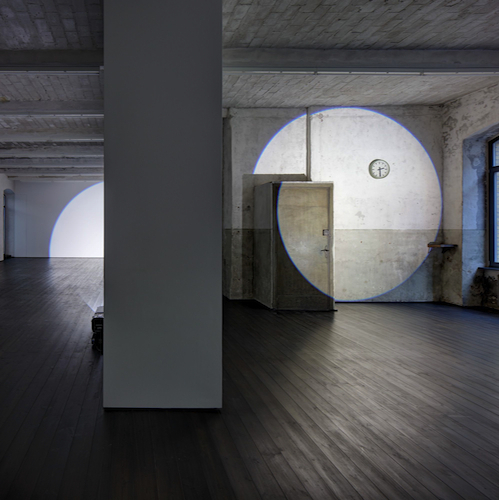 A circle of white light is projected onto the same wall as the entrance, and when the door is opened to allow visitors in, the circle breaks and the light projects into the hallway or onto you as you walk into and through it. Verjux makes sculptures with light. Nothing else is needed. Is this a reduced means of expression? No: With a circle, one can say everything. A circle, after all, infers completion, and what is more complete than something whose very materiality is disputed, a thing whose thingness is compromised, that is simultaneously present and not? There are only two works in this exhibition. Go into the next room to find the second one, Poursuite rasante et frontale, mur/sol/mur (source au sol) (Next boring and frontal, wall/ground/wall [ground source]). This circle has been smeared all over a wall. Its projector has been set up in the corner, angled so that the light does not go straight across the room as it does in the first work but instead sluttishly rubs itself against the wall it parallels. Verjux’s spheres call attention to the emptiness of the spaces they fill, igniting all sorts of Beckettian sentiments. It requires a lot of courage to say nothing so brightly.